NuTeen has always been a brand I've bypassed in Guardian or Watson. Their products seem to focus more towards active acne (as in papules and pustules) and I think I'm lucky enough not to get those very often. I'm still dealing with whiteheads (which is still one of the many kinds of acne, I know, it's complicated), but that's not the case for this review. NuTeen targeted customers also seem to be among the younger generation, not someone as old as I am, who's reaching 30s in few more years *coughs*. 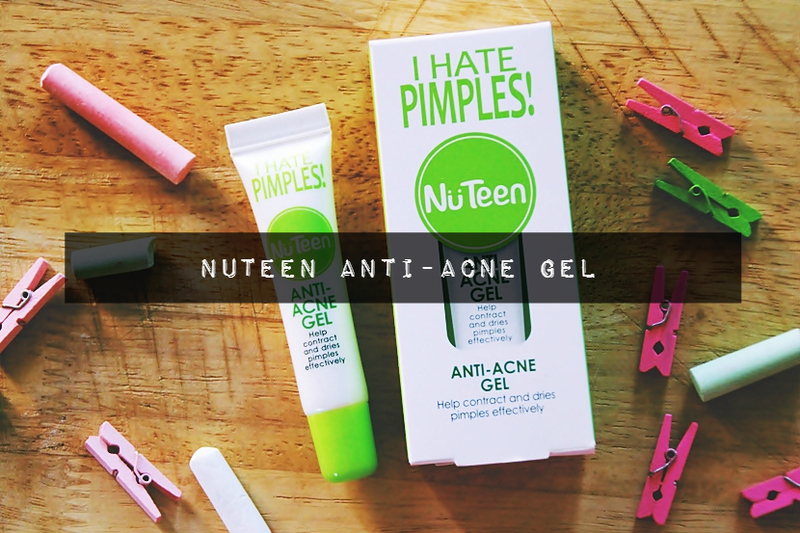 There's something about NuTeen Anti-Acne Gel though, that made me repurchased it twice before I decided to give my full commitment towards Nixoderm [review here]. Thanks to one of my fellow local beauty blogger, Kei, I discovered that NuTeen skincare is under Ginvera, who also owns Syahirah (a well-known Halal drugstore skincare brand to locals). You can find NuTeen almost everywhere in Malaysia and the price range is very affordable. "Specially blended with natural herbal ingredients, Triclosan and Thanakha Extract as a targeted solution to treat pimples. Effectively contracts and reduce redness of pimples while providing anti-bacterial and anti-inflammatory properties to clear pimples within a few days, thus leaving skin smooth and blemish-free." After cleansing, apply 3-4 times daily to the affected area for quicker healing. Use continuously for a week to lighten pimple scars. Lip-gloss tube! Although the slanted opening is meant to make the application easy to use on the skin, I'd suggest using a cotton bud as an alternative to avoid bacteria transfer. Water, Propylene Glycol, Carbomer, Limonia acidissima Extract, Lonicera caprifolium (Honeysuckle) Flower Extract, Lythrum salicaria Extract, Prunella vulgaris Extract, Oldenlandia diffusa Extract, Glycyrrhiza glabra (licorice) Root Extract, C12-14 Pareth-12, Fragrance, Salicylic Acid, Triclosan, Menthol, o-Cymen-5-OL, Biotin, Triethanolamine, Zinc Oxide, Sodium Oxide, Calcium Oxide, Magnesium Oxide, Alumina, Ferric Chloride, Disodium EDTA, Methylisothiazolinone, Phenoxyethanol. I've added it into the CosDNA database, link [here] and honestly, if you were to ask me, I'm nowhere near impressed with the formulation. I doubt all those plant extracts are high in concentrations because that is just how it works- you can't put too much of them when formulating a product, so, I don't know... when I look at it again, I'm a bit disappointed that the "active-ingredients" are not listed as the top 5 main ingredients. In fact, fragrance is even higher in concentration than those. Apart from water (aqua), propylene glycol (humectant) and carbomer (viscosity controlling agent, gel stabiliser), there are a lot of plant extractions used in formulating this product and to be honest, other than licorice root extract, I've never heard of these plants that they used in this gel would give significant anti-inflammatory effects to acne. So this is the time where I supposedly click on 'Google Scholar' and read journals but I'm too lazy to do that. I did search for Limonia acidissima extract though, and journals associating it with acne, but the search engine only yields me 58 results compared to ingredients like salicylic acid and triclosan; meaning that there aren't much extensive researches being done or the ingredient does not have quite outstanding properties in treating acne. Salicylic acid (from what I read, percentage can range from 0.05 to 2%) is a notable ingredient related to acne. It has a keratolytic property whereby it will exfoliate the skin by softening/dissolving keratin and that will helps in reducing redness. Since NuTeen does not mention anything, this acne gel has an unknown percentage of salicylic acid. Also, whether the acid will successfully exfoliate the skin, it totally depends on the concentration and pH of the finishing product (ideally pH 3-4). At this point, I just wished I had my pH strips with me to test the product whether it has the correct pH or not. Another ingredient that caught my interest is Triclosan (should be less than 0.3% in OTC cosmetic products). It's an effective anti-bacteria and also able to reduce redness surrounded the acne. The thing about Triclosan is that, the chemical has some short of bad reviews recently since FDA has been banning it from antibacterial wash products due to its ability to develop bacterial resistance condition [read here]. Then again, we are talking about an acne spot treatment, not some kind of body wash but I would personally think the same; let's say I cleared my acne successfully using Triclosan and continues to use it, I think I should be concern that Triclosan might form a bacterial resistance, just like the condition you'll be getting from not finishing your prescription antibiotic. Strictly based on my personal experiences okay? okay. 1. It reduces the appearance of papules acne but doesn't do anything to pustules acne. All acne are not equal, they come in many forms and sizes. Papules are like those elevated red and firm blemishes that have not yet reached the surface. They can also be less active and more active. 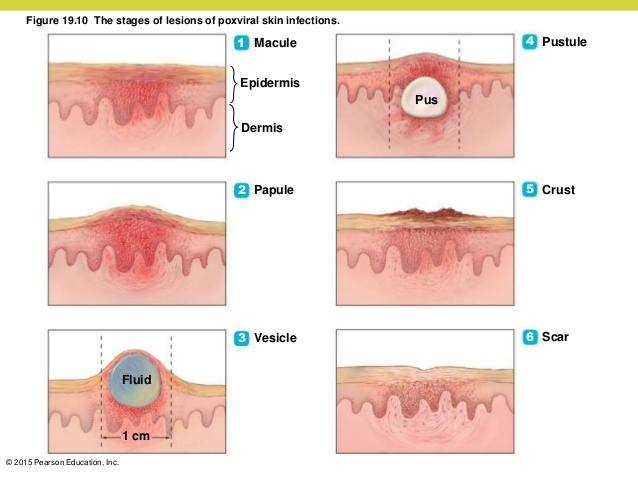 Meanwhile, pustules are like papules but with yellowish, liquid pus (or what we called them as jerawat masak in Malay). For pustule, using acne patch seems to be more effective as you can get it removes overnight. Papule is a different story. I personally believe anti-inflammatory spot treatment (cream or gel) would work the best to calm down the inflammation. 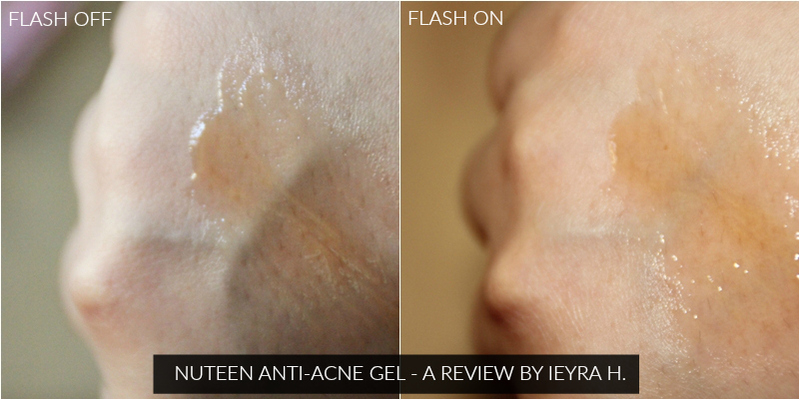 I put this gel onto my papule acne and leaves it overnight to heal. I have to say though, this is no way a miracle product so it won't make the acne vanish in one day, HOWEVER, just like I've mentioned above, salicylic acid aids in healing, so at times I see the red swelling kinda disappear and sometimes my acne reduces in size. And since salicylic acid gives the idea of exfoliating, it might as well lighten the PIH (post acne hyperpigmentation), though I'm not sure if I have noticed any significant different. 2. Very mild, moisturising, not hurting, and cooling as soon as I put it on (due to menthol). The scent is nice too. 3. Advisable to use it in a night routine not morning, unless you don't do makeup. Reason: just because it takes forever to dry. Unlike Nixoderm that I've reviewed earlier in this blog, I don't think NuTeen Anti-Acne Gel is meant to be a product that's going to dry in any short amount of time. It's very gel-like, and feels sticky. I observed that the gel has a clear consistency but it is in yellowish-brown colour (and straight up reminds me of honey!). So, imagine if using it under makeup, I'm sure the gel won't stick around properly coating the acne. 4. Another important to note that this is a spot treatment, not some sort of moisturiser, so the technique of application is different. You put a little amount of it onto your acne, not spread onto the whole face like you'd do with other skincare. Where it stands on my Korean-inspired skincare routine? Well, as for me, I will apply it directly, meaning that I don't put toner, serum, and moisturiser onto the affected area. Where to buy: AEON Wellness, Guardian, Watsons, Tesco etc. To be honest, I was surprised when I noticed that this gel worked in reducing the redness of my acne and how much I've had been enjoying it (hence the repurchased). Surprise lah because I have low expectations from it or any products coming from NuTeen, 🙊. I figured the effective way to get the most out of it is to apply the gel continually even after the acne has cleared and if you have strong cystic acne though, this NuTeen Anti-Acne Gel probably wouldn't be enough. I'd give this a 6/10 rating. K-BEAUTY! What's In My Wishlist This Year?